further investigation is conducted and additional information is developed. in thick smoky conditions while cutting dozer line on the Pond Incident. physical address of the property where the accident occurred is near 184 Pond Road, in Mendocino County, California. Topography: Heavily wooded, steep terrain. Slope was estimated to be 88% at rollover site. Moderate Rate of Spread in ground fuels with occasional torching of Needle Conifers. Significant short range spotting based on wind and receptive fuel beds. setting. The fire was spotting in areas due to winds, steep slopes and receptive fuel beds. connect the line to the upper portion of the road. distance downhill (approximately 10 feet). 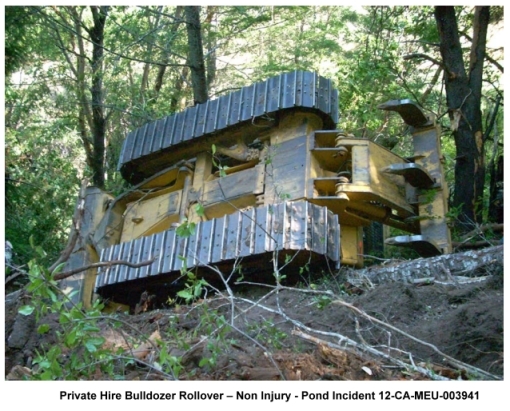 The operator stated the slide caused his downhill tracks to settle on a loose root wad mass. The operator said as he began to move the dozer the root wad mass acted like a fulcrum and flipped the dozer onto its side/top. The operator said he shut the dozer off and waited to ensure the dozer was done moving. Once he was confident it wasn’t moving any further, he released his seat belt and exited the dozer without any further incident. noted. The extent of the mechanical damage has yet to be determined. • All firefighters need to continually weigh risk versus benefit in their strategy and tactics. slopes when conducting direct or indirect line construction. monitoring the slope and terrain. efforts must remain aware of rolling rocks, debris, machinery and other hazards.